County Durham-based Seaward Group has been presented with the Queen’s Award for Enterprise for its Rigel Medical range of test instrumentation. 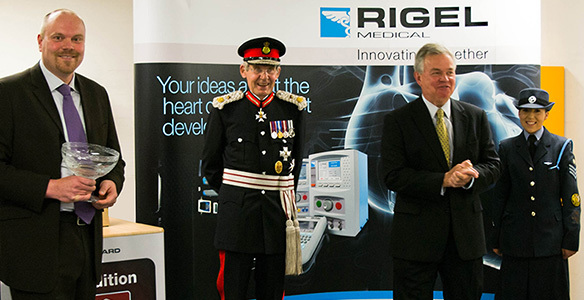 The company was presented with the award by the Lord Lieutenant of County Durham, Sir Paul Nicholson, at a special event to mark the export sales success of the Rigel range of biomedical test equipment. The Queen’s Award for Enterprise is one of the highest honours that can be bestowed on a UK-based company and is awarded each year to those demonstrating outstanding achievement. Rigel Medical test equipment is used by biomedical engineering staff and medical equipment service teams in hospitals and healthcare facilities in Europe, North America, the Middle East, Africa and the Far East to check the safety and functionality of specialist equipment including defibrillators, ECG monitors and ventilators. The Queen’s Award reflects Rigel’s market growth and investment in overseas sales and marketing strategies that have successfully boosted the international profile of the brand. As well as its manufacturing centre in the UK, the Seaward Group also has a US subsidiary in Tampa, Florida, technical support offices in Europe and an international distribution network. John Backes, associate director of Rigel Medical, said: “The Queen’s Award is one of the highest accolades a company can win and recognises the efforts we have made to innovate and enhance biomedical test equipment technology over several years. “Export sales are increasingly important to our business and the constant challenge is to maintain a competitive edge against much larger global groups and the lower production costs of overseas-based manufacturing operations.